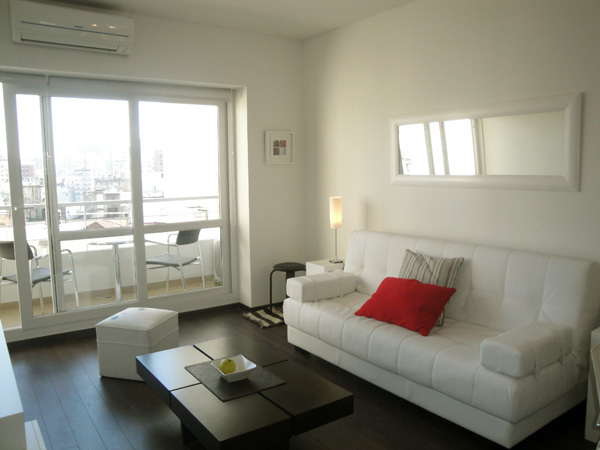 Upmarket and very affordable 1 BR apartment located in recently built modernist high-rise in Recoleta district. The apartment is very comfortable, it has a living area with sofa, LCD 21 inch , aircon hot / cold, Internet Wi Fi. Windows with exit to the large balcony. The dinning area offers a design table and chairs to seat four. The kitchen is open plan to the living, it is fully equipped. The bedroom is en suite with bathtub and shower, aircon, closet with large mirrors and windows with an exit to the balcony. Also it has a guest toilet. The apartment is furnished to the highest standart. Every detail in the apartment hand picked for ultimate design. Situated at the back of the building which ensures peace and quiet. Hardwood floor. Wi Fi, LCD 21 inch, cable TV. Aircon in both rooms. Safe box. Landline telephone for local calls. Guest toilet. Complete bathroom en suite. Iron. Hair dryer. The kitchen is equipped with refrigerator, freezer, microwave, electric cooker, toaster, coffe-maker, kettle. kitchenware and dishes. Towels and bed linen are supplied. Brand new high rise building, it offers a swimming pool for summer season, BBQ area. Laundry . Doorman 24hs. Three elevators. City centre, bus stop,Subway stop, church, university, college, gym, solarium, restaurants, pub/bars, nightlife area, exclusive shopping area, park, square, cinema, museum, art gallery, cultural centre, concert hall, historical place, market, convention centre, laundry, parking space. Included: Electricity, gas, water, building fees, city taxes, cable TV, telephone, internet, cleaning service once a week.